August 19, 2003, Tikrit, Iraq. Special Ops forces are sent in to investigate shooting and gunfire that took place the day before. The US soldiers are ambushed and attacked with a grenade launcher. Machine gunfire hoses them down as they try to take cover. The soldiers are wounded. They sustained one fatal casualty, their interpreter, Nadan Younadam. August 24, 2003, Mar Odisho Church in Chicago. Juliet, Nadan�s wife of 30 years, and his sons, Khouyada, 24 and Atouraya, 21, were comforted by friends, family and dedicated compatriots in a heart wrenching wake that mourned the loss and, at the same time, celebrated the admirable life of a noble Assyrian that served his nation till the very end. Nadan pristinely believed in and dedicated his life to the Assyrian Cause. He did not have to contemplate about volunteering to aid the Coalition Forces, particularly the US military, in the war to topple the Iraqi dictator. For him it was a golden opportunity to return to his homeland and contribute to cleansing the region of the inhumane government notorious for its disregard of human life and rights and its continuation of the legacy of persecution towards Assyrians in the Middle East. Nadan was born in Nouhadra (Dohuk), North Iraq on September 21, 1946. He graduated Dohuk High School in 1964 and served 2 years in the Iraqi Army. In 1973 He married Juliet Toma in Lebanon and immigrated to the United States. Nadan had two sons, whom he named after the two most important elements required for national survival, Khouyada (Unity) and Atouraya (Assyrian). In 1973, upon arriving to the U.S., he joined the Assyrian Universal Alliance (Khoyada Teeweelaya Atouraya). From 1976 to 1980, Nadan served in U.S. Navy. He was a member of the AUA Central Committee from 1988 to 1989. He was an AUA Executive Board Member from 1988 to August 19, 2003. Nadan�s love for his Omta was clearly portrayed in his actions and efforts in life. In 1984 he traveled to Washington, DC to protest the arrival of Tariq Aziz and his intentions of establishing an Iraqi Embassy in the U.S. 1992, Nadan traveled to Northern Iraq following the uprising to transport aid to the Assyrians of that region. 1994, he was one of the founders that established the political arm of the Assyrian Universal Alliance. 2000, he organized the first Congress of the Assyrian National Organization (Mtakasta) in Northern Iraq. 2000 to August 19, 2003, he was a member of the political bureau of the Assyrian National Organization as well as its secretary to Canada and the United States. The importance of grassroots community involvement was not overlooked by Nadan. 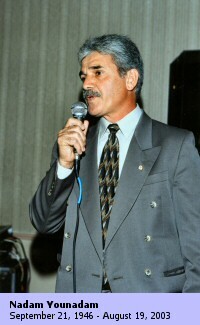 In 2000, he organized the first Kha B�Neesan parade in Stanislaus, CA. In 2003, prior to his departure for Iraq, he organized the construction effort of an Assyrian Library in the Urhai Club of Stanislaus, CA. To Nadan Younadam the prime directive was simple and consisted of two parts: 1) preserve and perpetuate the Assyrian culture and 2) the nation or �Omta Atoureta� is above any and all organizations, institutions, individuals and groups. Nothing demonstrated Nadan�s dedication to his convictions and his people more, than his decision to go and risk his life side by side with the Coalition Forces for the sake of establishing democracy in Iraq and thereby securing the future of the Assyrian people in the Assyrian Homeland. Nadan Younadam went to Iraq knowing full well that he may die. He left his family and embarked on his mission for the sake of justice and freedom. The Assyrian Nation did not lose a patriot, it gained a martyr. For Martyrs make the ultimate sacrifice to advance a belief, cause and principle. Nadan had requested to be laid to rest in Nouhadra, North Iraq should anything happen to him. May God rest His Soul and bless his family and friends for their loss.